I don't know about future overseas assignment for Shah but one thing is already certain: Shah and I will spend a good portion of 2018 in another state in Malaysia for this project he's involved in, which means more of #thathotellife for me — only this time we would be assigned to a long-term hotel room, so that should hopefully make the transition a little easier on us! I have stayed in some sweet hotels throughout my traveling but since nothing beats an actual homey home, I fully plan to transform our hotel room into our second home by individualising it. I'm not looking into making colossal changes (plus I doubt anything too drastic would be allowed) but instead will be concentrating on adding a few personal touches here and there. I've been enjoying browsing through LionsHome UK, a home and living website to get some inspirations; I already have some ideas about which practical yet transformative items that can personalise our hotel room to lessen the inevitable homesickness. I'd love to get like a Hollywood-style mirror with the lightbulbs around the side but perhaps a 2-in-1 portable full-length mirror would be a better option for a temporary home. 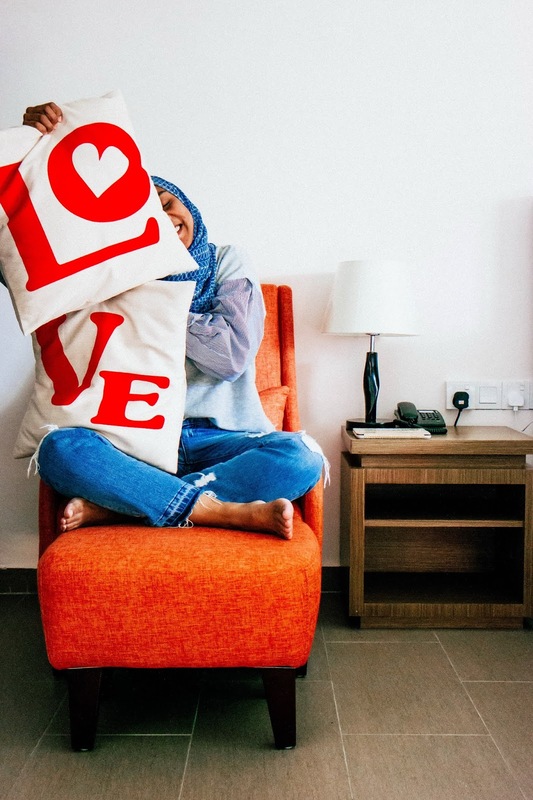 The "LO" and "VE" cushions will be in our hotel room only temporarily so I'm really excited to hunt for a couple of new throw pillows to match the decor of the assigned hotel room! It isn't unusual for a hotel room in Malaysia to not be carpeted, especially hotel resorts that are near beaches (by the way, yes, I will be living near a beach, although sadly it won't be safe to swim in the water!). I generally don't mind bare flooring since it is hot and humid here but since I like to keep my feet extra warm and cosy, I would ideally like some parts to be carpeted, which was the exact way I did my own house. I think a beautiful statement-making carpet is the best way to give a living space personality. I'm really into some of the black-and-white striped carpets available on LionsHome but at the same time I also gravitate towards the brighter teal blue or red. Whatever I pick will have to match (or at least beautifully contrast!) the already-existing decor in my hotel room (which includes a bright orange armchair), but I can already imagine a beautiful carpet or rug doing wonders for the space! Seriously though, there is so much work to be done in the space before I can proudly call it my second home. I can't wait to get started on the planning and the shopping — wish me luck guys! 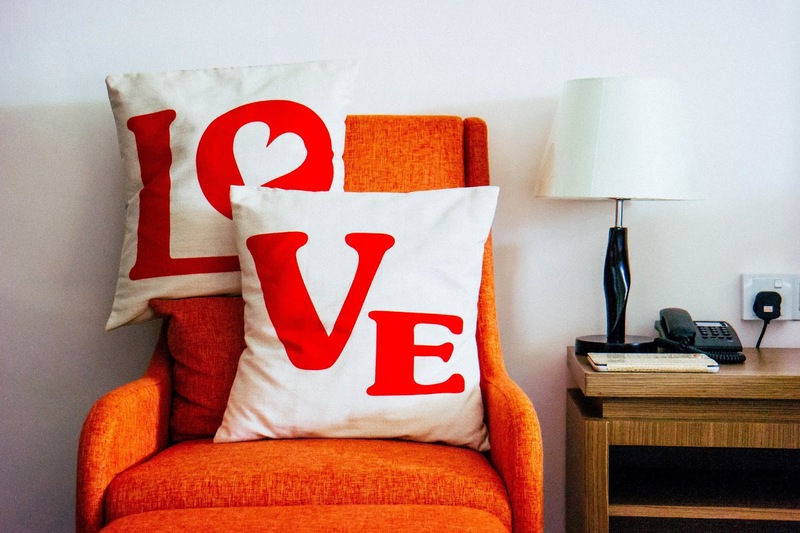 Well, who wouldn't love a bright orange chair in their home away from home!?? You're going to have so much fun adding happy colorful accessories Liyana! I have ALWAYS been a fan of orange. I immediately think of how effectively Samantha pairs orange with her signature cobalt blue! So there's an option? Also, I saw a great patch rug in hot pink on the Lion'sHome site. Pink and orange are such a thrilling combo!! Besides your cute love pillows you're probably going to want a snuggly throw to add to the current white bed linens. Wouldn't a big buffalo plaid of hot pink and orange be great?!? I've had to purchase a few rugs for our new home and for the smaller areas. (bathrooms and bedrooms) I'm thinking very seriously about buying a plain,off white, cotton rug and then using stencils and my own creativity to embellish it! Could be fun, a disaster, or a huge success! (most likely somewhere in between) :-). I've always loved a good orange / blue combo - I'm crazy about cobalt blue and electric blue - but I am quite partial to a blue that's more like teal for this room for some reason. 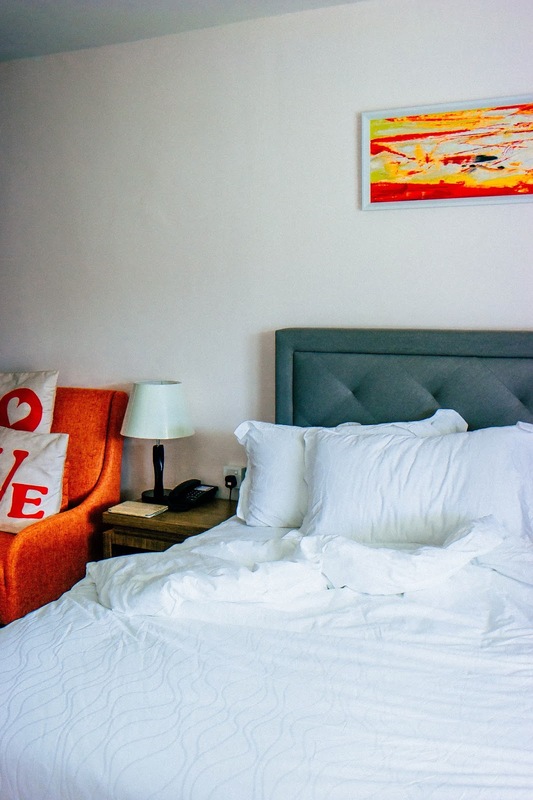 Did you notice the crazy yellow / orange / red watercolour painting above the bed? I need to put that into the equation as well, don't I? Ooof. Ahhh LOVE the idea of a snugly throw, especially one that catches the eye! I don't think I ever use white linens in my own home, for the same reason I rarely wear white: just too susceptible to stains. So yes I'm all for adding something onto the too-white bed. By the way, I don't think it's common in Malaysia to have throws around the house, since it's too hot without air-conditioning, but when I lived in New Zealand I was ALL about them cosy throws and blankets and capes and I put them around my studio apartment so I could reach for any which to stay warm. Ahhh good ol' times. Me and DIY do NOT mix. If you decide to get on with your rug project, do let me know how you get on (and share pics, as always! xxoo).